It was his first time as pitcher. The season started off rough. I felt the need to apologize to other parents. I often found myself thinking, “maybe he was not the right one for this position.” And yet, as the season crept on, he began to grow in confidence, and in performance. Driving to the last game of the season, it was a misty spring evening. He repeated, “with God, all things are possible.” Watching his mental drive and emotional growth nearly brought me to tears. He got out there, amongst his friends, his teammates. It was a long and gruling game. Strike one, Strike two, Strike three... OUT!” The third out, by the pitcher, my son, to win the game. A team who had gone from worst to first won the championship! The last 13 years during my ESP tenure I have often thought, “maybe I am not the right one for this position.” It could be after a conversation with an employee or board member but mostly the series of late nights where I miss my children going to bed. And yet, with every turn I see God pointing me in one direction or the next. I see growth in myself, growth in others and the constant call to make the pitch. The cutest little miracle league player you’ve ever seen! We pitched something new: The ESP Miracle League. 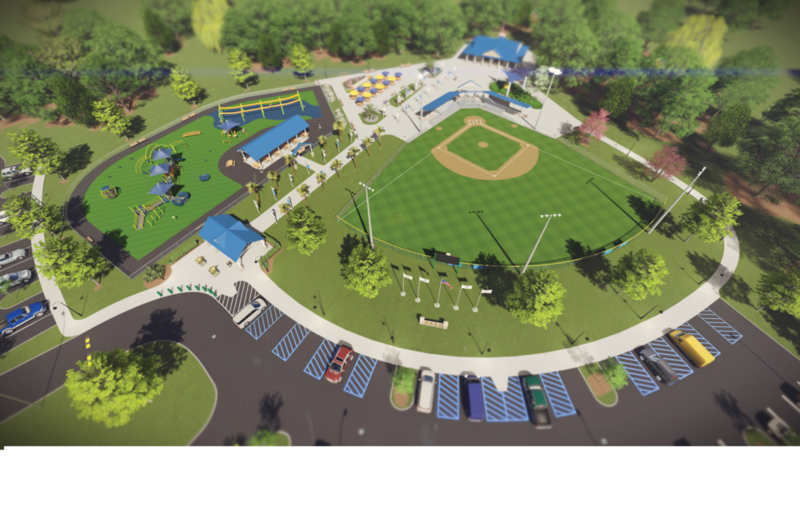 Our hope is a fully accessible baseball field complex... where kids of all abilities will have the opportunity to play ball and where kids without disabilities can learn to play alongside them with a playground and splash pad. And beginning today, we are launching a goal to raise the funds we need to “Light Up our League” by the end of this year to cover the cost for the lighting of our special field so we can play day and night. Our total goal is to raise $5,000 TODAY and $50,000 by year end. Pitching can be scary. And it is certainly scary pitching this new vision to our community while our ESP friends wait in anticipation to play. ESP has taken on a lot the past few years but we have practiced and our team is ready - despite the fears- to take on this venture and play a new game. Why? Because every kid, regardless of ability, deserves to play. I am overwhelmed by the idea of giving friends at ESP the opportunities Owen has had and so I am digging deep in my position as I pitch alongside my ESP team to launch the ESP Miracle League. My hope is that other parents in our community- who have had the gift of watching their children play ball- will join me, dig deep, and together we can make this miracle in our community possible. Will you help us light up our league?